Geneva, Switzerland is a great city to visit. There are many things to see in Geneva, but sometimes people are fortunate to be able to spend more time in Geneva and would like to see some other places around the city. I was able to visit Geneva several times and I learned about a few beautiful places right around Geneva. Each is within easy driving distance and makes for a great day trip. The area surrounding Geneva is simply beautiful! 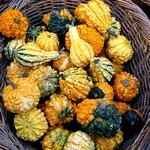 If you have a few extra days to spend in the Geneva area, you can easily visit many places. So, come along with me on my favorite day trips from Geneva. Located across the border into France, Perouges is my favorite day trip from Geneva. This small village is one of those beautiful places that makes me want to come back to Europe and visit as often as I can. A small medieval village perched up on top of a hill, Perouges is a perfectly preserved medieval jewel. You would never find anything like Perouges in America. Situated only about one hour and a half driving from Geneva, Perouges is situated in the mountain region of Rhone-Alpes in France. The road from Geneva to Perouges was also beautiful, winding its way through the Jura mountains between Switzerland and France. Everything is green and beautiful. Once you come close to Perouges, the landscape turns from mountainous to gentle rolling hills filled with wheat fields. This is beautiful French countryside. If you are looking for a charming and affordable hotel, try The Resid for Calixte right in Perouges. Or you can search budget hotels in the Rhone-Alpes area. Read my walking tour of Perouges for more travel tips from this beautiful area. My second favorite on my list of day trips from Geneva is Annecy, also in France. Annecy is only about 45 minutes driving distance from Geneva and it makes for a great day trip. We loved this old town and we happened to visit during the largest Farmer’s Market of the entire year. Annecy has the most amazing location we’ve seen. It’s nestled in the mountains and the Annecy Lake is just gorgeous. The drive from Geneva to Annecy is very pleasant, especially when getting closer to Annecy on the A41 motorway from Geneva. It’s a beautiful and short drive, so it’s worth all your time. (see my photos from Annecy). The best way to get to Annecy Lake and Annecy Old Town is to look for signs pointing you to City Hall (Hotel de Ville). Once you get in the area try finding some parking and then just walk around the lake area and start walking up the canal. The easiest way to get to Annecy from Geneva is by taking a half-day bus tour of Annecy from Geneva. If you need a hotel you can stay at the excellent Allobroges Hotel (great value, free parking and great location) or you can search budget hotels in Annecy. 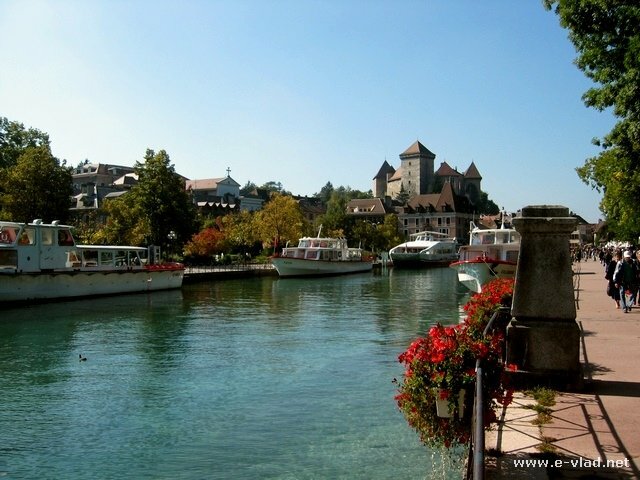 For more travel tips you can read my walking tour of Annecy, France. Third place on my list of day trips from Geneva is in France again. It’s the mountain resort of Chamonix. This beautiful village is located one hour away from Geneva on the A40 freeway. The drive from Geneva to Chamonix is just amazing! The French Alps line up the freeway and are looming right in front of you. It’s just really cool to see. 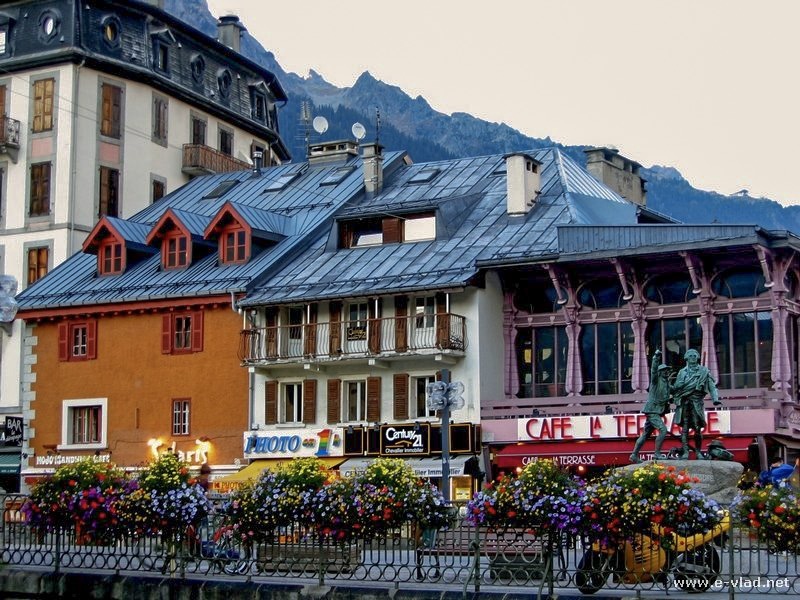 The village of Chamonix is charming in the summer. The village of Chamonix is the gateway to the French Alps and the Mont Blanc peak which is the tallest peak in Europe. While the Alps are the main attraction at Chamonix, the village itself is a really quiet retreat from the busy life in Geneva. If you are planning a day trip to the Chamonix Mont Blanc area of France you can stay at the beautiful La Tanière de Groumff (lots of charm, free breakfast and free parking), the excellent and convenient Hôtel L’Heliopic Sweet and Spa (excellent location and charm) or at the very affordable Fleur des Neiges. You can also find other great hotels in the Chamonix area or you can book a day trip from Geneva to Chamonix and Mont-Blanc. For more specific travel tips, you can read my walking tour of Chamonix, France. Continuing with my favorite day trips from Geneva we find another small village in France. Yvoire is just across Lake Geneva inside France. 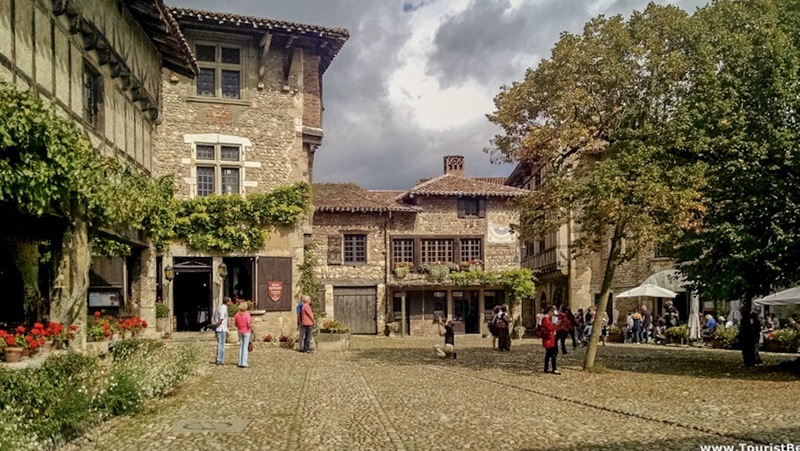 Yvoire is only about 30 minutes driving distance from Geneva, but a visit to this small village will take you way back during medieval times. Yes, Yvoire is very touristy but for a good reason…it makes for a great tourist destination. Old cottages, city walls and cute restaurants will make your visit worthwhile. Old chateau in Yvoire, next to Lake Geneva. You can reach Yvoire, France two ways: across Lake Geneva by boat or by car when you drive around Lake Geneva and enter the French area of Rhone-Alpes. Using a car is faster and beautiful but the most scenic way is by boat from Geneva or Montreaux. If you are looking for hotels in this area, you can find the best prices for hotels in the Rhone-Alpes area or book a beautiful day tour of Geneva and Yvoire. For specific details you can read my walking tour of Yvoire, France. We are finally back in Switzerland on our list of day trips from Geneva. Gruyeres is a Swiss medieval village which makes for a great day trip from Geneva. Yes, Gruyeres is very touristy but there are good reasons why the medieval village of Gruyeres is so popular. The old village of Gruyeres is perched on the hill and an old cobblestone road winds its way through the middle of the village. At the end of the road you will find an imposing medieval castle. 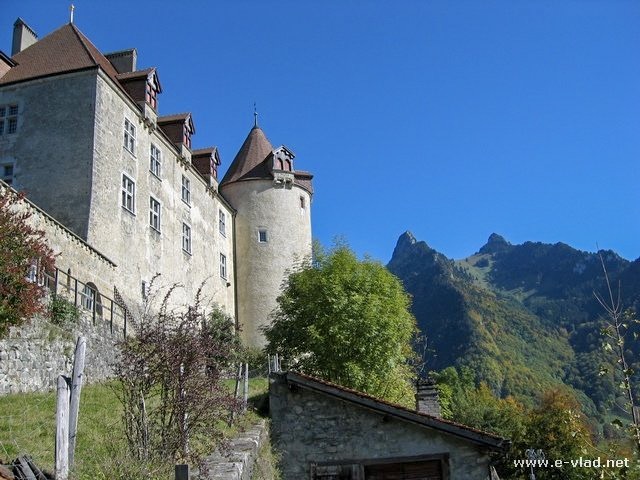 The castle in Gruyeres sits on a hilltop overlooking the mountains. Gruyeres is located about one hour and twenty minutes driving from Geneva. Once you get off the motorway, the country roads are simply beautiful, with the postcard-perfect green lawns and snow-capped Swiss Alps mountains in the distance. 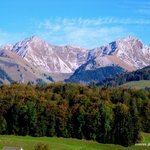 When you are planning your day trip to Gruyeres, Switzerland find the best prices on hotels in the Gruyere region of Switzerland or you can book a day trip to Gruyeres from Geneva. You can find more details about visiting Gruyeres in my walking tour of Gruyeres, Switzerland. 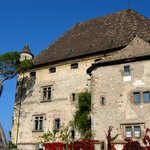 Suggested by a long time reader of my site, Estavayer is a small town near the shores of Lake Neuchatel in the Fribourg Canton. 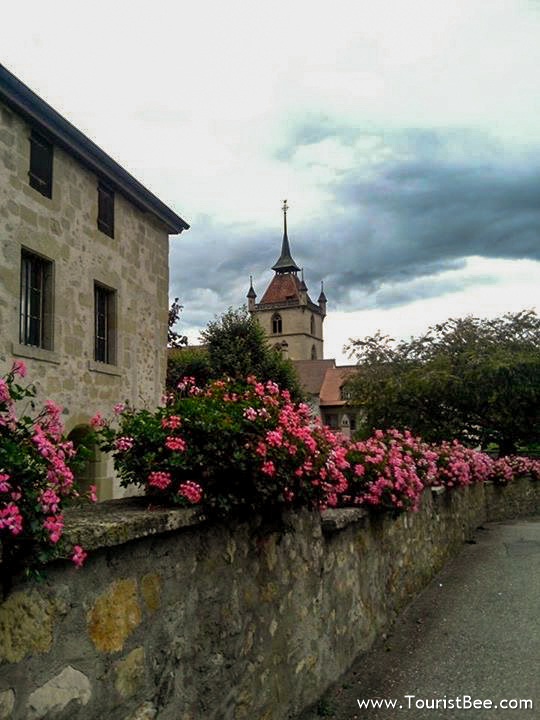 Estavayer is a quaint village that definitely deserves a place on my list of day trips from Geneva. Estavayer le Lac, Switzerland – Beautiful flowers covering a stone wall and buildings with the tower of Saint-Laurent church in the background. If you are planning a day trip to the area you can find great hotel prices around Lake Neuchatel. Romaimotier Envy is a tiny old village located about an hour and a half drive from Geneva in the Vaud canton. It is well known for its beautiful old Romanesque church. Suggested by a reader, Romaimotier is another tiny place I plan to visit on my next trip to Geneva. 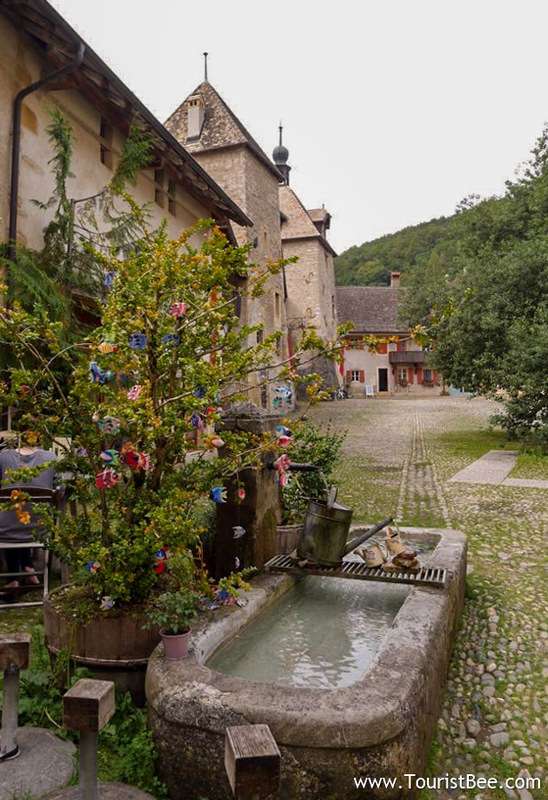 Old water fountain and cobbled stone alleyway at Romainmotier-Envy, Switzerland. If you’re planning a trip in this area you can find discounted hotel prices in the Lake Geneva/Vaud area. Montreux is the jewel of Lake Geneva and deserves a good place on my list of day trips from Geneva. World famous for its rock and jazz concerts, Montreux is also known by its nearby Chateau do Chillon which served as inspiration for Lord Byron’s work. If you are in Geneva, it is worth your time coming to visit Montreux even it if it’s only for the amazing views of the lake. 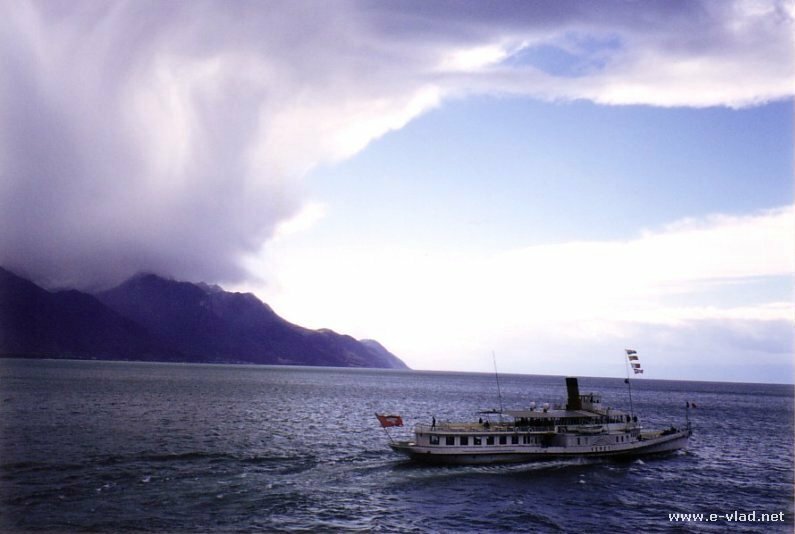 Montreux, Switzerland – Beautiful view of a tour boat on Lake Geneva as storm clouds start to gather. Unfortunately, you have to change two trains in order to get to Montreux by train from Geneva. The easiest and cheapest way to get to Montreux from Geneva is with a direct local bus. You can also join a day tour of the Swiss Riviera for a beautiful day trip to Montreux. If you want to visit Chateau de Chillon, you can purchase a ticket and skip the line. Switzerland is very expensive in general but you can find budget hotels in Montreux if you are willing to stay a bit further from the lakefront. Book a beautiful day trip from Geneva to Montreux with entrance to Chaplin World and Chateau de Chillon. Next on my list of day trips from Geneva is Ovronnaz which is located north east of Geneva. Ovronnaz is a thermal springs town and ski resort in the winter. This alpine town is high up in the mountains above the Rhone Valley area and provides access to the Swiss Alps both in the summer for hiking and mountaineering and in the winter for all the winter sports thanks to the beautiful slopes available in the area. The drive from Geneva to Ovronnaz takes about 2 hours and it is a beautiful drive on the road that hugs Lake Geneva as it enters the beautiful Rhone Valley area. Once you arrive in Ovronnaz, you can look for signs for the ski lift which is available in the summer as well. The panorama from the top of the ski lift is simply awesome. When you plan trip your next day trip to Ovronnaz from Geneva you can find the best prices for hotels in the Valais area of Switzerland. If you are in Yvoire, just drive a little further up the road and visit the beautiful marina at Thonon-les-Bains. The town itself is not very interesting with the exception of the old Chateaux de Ripaille. However, the marina on Lake Geneva at Thonon is superb. To reach the marina you just drive down the hill and follow the signs. Thonon-les-Bains, France is located about 10 minutes drive north from the village of Yvoire, France. 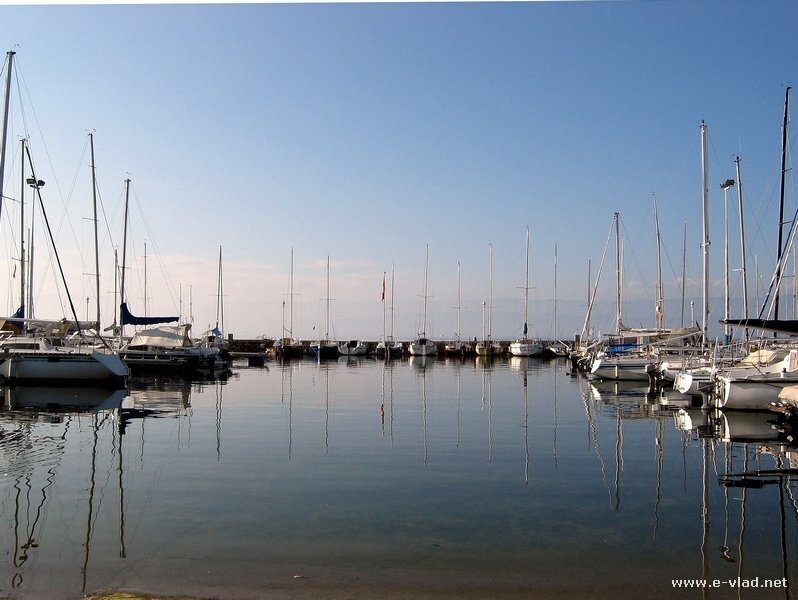 The marina area in Thonon is peaceful and beautiful and it is worth your time to drive a few extra miles to get there. 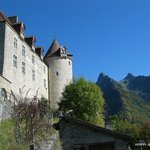 When planning your day trip to this area you can find great hotel prices in the Rhone-Alpes area. Check out the boat schedule for Lake Geneva. There are frequent boats to all major destinations around the lake. 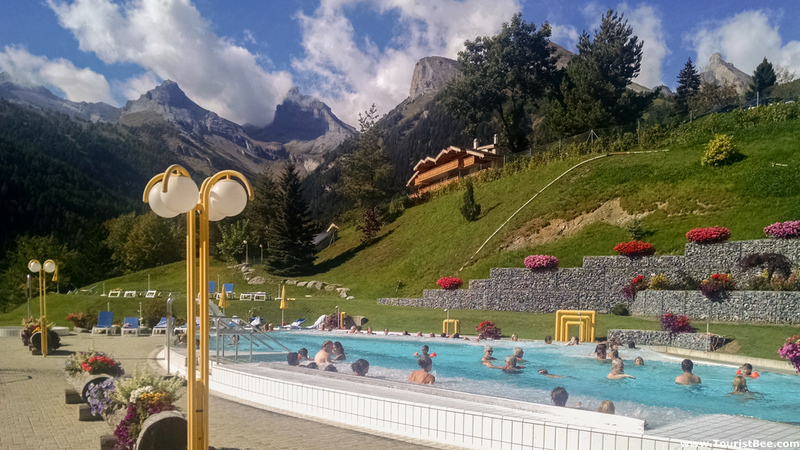 Look for budget hotels in Geneva, Montreux or Rhône—Alps area of France. There are lots of options available. Depending on how you get to your destination, you just have to pay attention to details like parking or proximity to the train station. 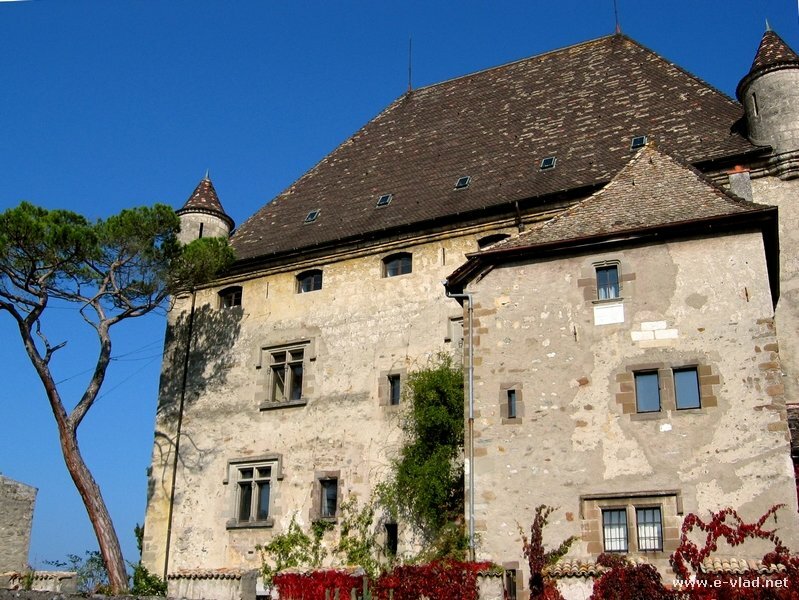 Find all local tours and day trips from Geneva as well as discounted museum tickets. If you are going by train, check out train schedules in Switzerland or France. If you need a rental car you can compare all the offers for cars in Switzerland or France and pick the best one. What do you do if while you’re exploring Geneva, work interrupts? Get an instant remote access to your online private work space on hosted Citrix Xendesktop from CloudDesktopOnline with cheapest Xendesktop cost. Learn more about Hosted SharePoint, Office 365 Enterprise E3 suite and managed Azure services by visiting Apps4Rent. Subscribe to my newsletter and get your free Smart Travel Kit. Learn how to maximize your money, photography and electronics while traveling, plus practical destination guides delivered to your inbox for free. Hi! We will be staying in Geneva in March and I was wondering if the trip to Chamonix is doable with a baby that time of year? Do you drive across the Alps to get there from Geneva or are the Alps next to the A40? The trip to Chamonix from Geneva is completely fine with a baby…you are not going across the Alps…but at the bottom of them. Taking the tram up the mountain to Aguilles de midi…might be a bit harder with the change in altitude and cold weather up top. However, I don’t think it’s bad and you should be fine and enjoying the trip. Yes…Chamonix is one of the trips I suggest as well…from Geneva. 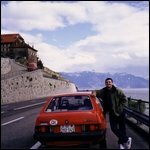 I’m Vlad and over more than 15 years I have been helping travelers save money and frustration on their dream vacations to Europe and California. Work together with me and learn how to plan your trips efficiently and save money and lots of frustration. 15+ years of international travel experience in less than 40 pages. With lots of choices throughout Europe and USA, I always get the best deal and service. Need local tours & museum tickets? The best choice for finding local tours and tickets all over the world. Save up to 30% by comparing all the companies and choosing the best deal. Save the driving and lots of money by using an intercity bus in Europe and USA. Tourist Bee Copyright © 2019.